Kayaking offers great outdoor experiences throughout the year from inland rivers to the lakes and out through the bays and beyond there are plenty of opportunities whatever your preference may be. Many people put their kayaks up for the winter, while others look to extend their time on the water and begin re-rigging and setting up for the beginning of duck season. Are you missing out? Why duck hunting out of a kayak? A kayak is great for navigating shallow waterways like marshes and other skinny waters which is the preferred habitat for ducks since they usually dive for submerged vegetation or small crustaceans on the bottom for food. This makes duck hunting from a kayak a great choice. Also, not everyone has a trained hunting dog so in order to retrieve your fallen ducks you can utilize your kayak for retrieving the ducks as well. This way you don’t have to wade through the marsh which can take several minutes depending on how far the shot was taken and quickly set back up and get ready for more incoming ducks. Typically, a dozen decoys are enough to get started and a “U” pattern or even a “V” pattern is effective for working birds in close for a clean shot. Remember, ducks prefer to land heading into the wind so always try to set up with the wind at your back. cross winds are usually okay but never set up with the wind to your face. Semi-automatics are the most favorite types of shotgun among duck hunters but pump shotguns are extremely reliable also. 3′- 3 1/2″ shells work best and remember NO LEAD SHOT. Only steel shot may be used when duck hunting. Just like most hunting, camouflage clothing is required and any additional steps you take to conceal yourself, like face paint, is a plus. Duck calls are used in conjunction with duck decoys to attract ducks and give them the confidence they need to land in the spread. There are various different types of duck calls that imitate different species of waterfowl including geese and teal. It is recommended to match the duck call to the ducks that you are planning to hunt or the ducks that are in your decoy spread. Waders are an essential tool in duck hunting. It is a good idea to get a good pair of waders with a high insulation value. This will not only ensure a safe trip but a comfortable one and an overall more enjoyable experience. NOTE: Remember, safety is always first and all rules regarding hunting in your area and kayaking apply. We’ll assume that you already have a kayak and a shotgun. So what next? Well, ducks can see extremely well so it is important that you keep yourself and YOUR KAYAK hidden just like in most typical hunting scenarios. YakGear offers the Ambush, a camo cover and kayak blind that keeps you and your kayak hidden that uses the Realtree Max-5 camo pattern featuring cattails, reeds, cane and grasses to blend into flooded marshes. Plus corn, wheat, oats and sunflowers to hide you in open fields. It has branches, twigs and leaves that work in flooded timber. And with open areas that mimic mud, water, bark and shadows, MAX-5 covers all the scenarios you might encounter ducks and is a favorite among many waterfowl hunters. Note the added vegetation straps on the Ambush kayak cover and hunting blind. These are used for adding natural or synthetic vegetation to your cover for the absolute best results in any hunting area. 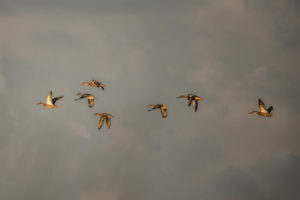 Typically, the best times to duck hunt are early in the morning at first light. This means that in order to be ready in time, you will need to traverse the marsh in the dark in order to be set up in time before the ducks start moving. For safety reasons, It is required by law that you have an overhead 360 degree light when kayaking in the dark so that you can be seen by other boaters. 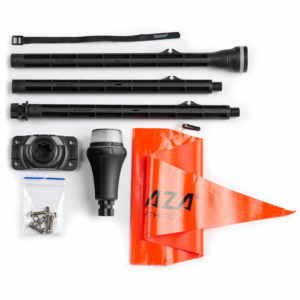 YakGear offers the RAILBLAZA Visibility Package II. The i360 light has 3 different modes: high beam, medium beam, and blink. It uses 3 AA batteries and offers 25 hours or more of use in the high beam mode and over 200 hours of use in blinking mode. This light has been approved by the US Coast Guard for 2 nautical miles or more. Disassembly is quick and easy and the kit will store just about anywhere which makes it perfect for kayaks. It is important that you keep your gear dry, especially your gun. Your gun should be unloaded when traveling and only loaded whenever you are ready to begin hunting. A waterproof/resistant case is recommended when traveling. When you’ve reached your hunting location, YakGear offers the RAILBLAZA Gunhold that keeps your gun secure. The RAILBLAZA Gunhold is sold as a single unit, however, we recommend 2 units per gun – one for the stock and one for the barrel. Please note that we recommend the RAILBLAZA GunHold is used in accordance with requirements of firearms legislation for the jurisdiction you are in. Included is 1 x GunHold Molding and 1 x Rubber Retaining Strap. Note: The RAILBLAZA G-Hold-50 also works well for a stock mounting as a complement to a single Gun Holder mounted to support the barrel. Aside from keeping your gun dry, it is also important to keep your ammo dry as well. For this, we recommend using the CrateWell. This portable live well can also be used as a dry storage and is perfect for keeping your ammo and items safe and dry. It is important to leave nothing but your footprints when duck hunting and the C.W.S. bags are perfect for keeping those spent shell casings and any other loose items in after each hunt. Lastly, you will need a cooler to keep your harvest fresh and YakGear offers YAK Coolers that do just that.YAK Coolers are among the toughest on the market and can be fully customized with YakGear or RAILBLAZA’s full line of products so you can personalize it to fit your needs.